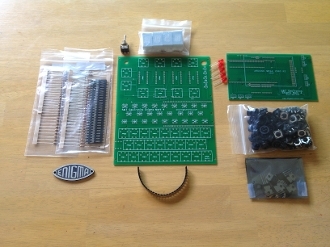 This kit comes complete with both PCBs providing software ONLY plugboard functionality. This kit was created as a kickstarter request with the very minimal components. This Kit includes the very minimum of Electronic components that are required to make an Enigma similar to the one pictured above. It does NOT include the Arduino Mega, batteries, battery holder, battery connector, charger, lase cut/engraved top plate or alpha labels. You supply your own 9 Volt battery.